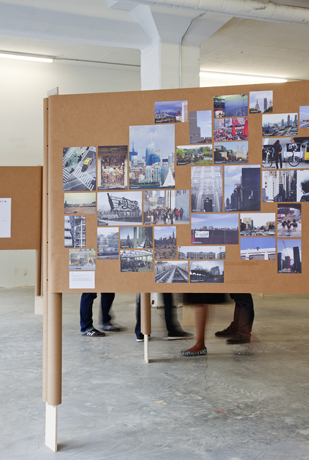 The photographs arrayed here were taken by the New New York Photography Corps, a group of nearly one hundred architects and design professionals convened for this exhibition who spent the past six months documenting what New York looks like at this moment in time. Conceived as an homage to Berenice Abbott’s Changing New York photo project of the 1930s, which similarly sought to document a transformed city in the midst of an economic downturn, the New New York Photo Corps submitted more than 4,500 images, one thousand of which are displayed here, to convey a sense of “the city we made.” After all of the plans and proposals of the past ten years, what does the city look like now? Though a single picture may be worth a thousand words, a thousand pictures are still incapable of fully capturing a city as diverse and enormous as New York. This montage is not intended as a comprehensive portrait of the city, nor is it meant to be a celebration of change or a record of the best that was built. It is very simply a document of the city in all its diversity, one that includes innovative new building as well as decaying infrastructure, out-of-scale development and abandoned housing, as well as streets and parks and neighborhoods. The NNY Photo Corps was organized in collaboration with Esto, with generous assistance from Peter Aaron, Francis Dzikowski, Jeff Goldberg, Amanda Jinks, David LaSpina, Peter Mauss, Joel Sanders, Erica Stoller, David Sundberg, and Albert Vecerka. Map View: In Map View, you can see the geographic distribution of the 1000 photos taken by the New New York Photo Corps. Click on any of the pins to see the photograph. You can also filter the photos in Map View using a variety of preset filters, including borough, neighborhood, photographer, tags, and projects. Selecting a filter will display just those photos. To restore the map to its full state, reset the filter to its topmost setting. Gallery View: In Gallery View, you can view the entire pool of photographs. Photos are sorted by photographer, in reverse order of first name. Though you cannot sort or filter the photos in gallery view, you can click on a photo, scroll over it and select the New New York 2010 tag to visit the full photo set on Flickr, which will open in another window. Flickr offers a third way of viewing the photos, one that allows you to sort and search them. To visit “The City We Imagined,” click here. To visit “The City We Made,” click here. For information about how to get to Governors Island, click here. League staff members Nicholas Anderson, Anne Rieselbach and Sarah Snider contributed in a number of ways to the development of the exhibition. The Architectural League thanks the following individuals for their assistance and advice in organizing this exhibition: Amale Andraos, Walter Chatham, William Dailey, John Fontillas, David Galipo, Hugh Hardy, Charles McKinney, Lyn Rice, and all of the individuals who agreed to beinterviewed for this project. The League also thanks Renee Schoonbeek of the Hudson Square Connection and Jonathan Dean and James Cosentino of Jack Resnick & Sons for their assistance in arranging the venue for the exhibition.